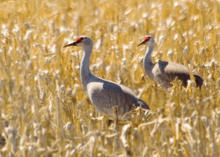 Said to be one of the greatest wildlife spectacles on the continent, each spring more than 80 percent of the world's population of Sandhill Cranes merge within the Platte River Valley. From March to May, over 250 species of water fowl flock to the Hastings area, making it a prime viewing location. For more detailed information please visit NebraskaFlyway.com. The site provides a single site where you can discover information about this incredible wildlife spectacle and how you can experience it yourself. This site also provides significant details on the birds and the central Nebraska area and points visitors to sources of additional information so you can plan their trip efficiently and conveniently.